CUBS’ A.C. in Ann Arbor! Our beautiful Center has all the latest features including BIG SCREENS over the Lanes so you don’t have to miss any of the basketball action while bowling. And it’s not just Men’s Basketball, either! We’ve also got a Lady Wolverines team in the hunt as well! Several of the booths at CUBS’ A.C. have an individual flat-screen TV which you can set to watch any game you please. By the Way – We are taking 15% OFF your purchase when you present your ticket stub just prior to or just after any one of the Michigan Wolverines teams play at home. Face it – you want something more than a stadium hot dog and a Coke! We encourage your attendance at all Michigan sporting events and we want to make it easy for you to get to the arena on time! We’ve also got a new cooler stocked with only craft brews Made in Michigan! 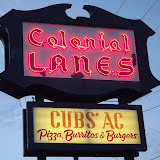 This entry was posted in Arbor Valley USBC, B1G, Bad Bowlers, Beginning Bowlers, Bowler's Digest, Bowling, Family, GO BLUE, Metro Detroit, Michigan Basketball, Uncategorized, Youth and tagged Best Value in Ann Arbor, BIG SCREENS, Colonial Lanes, Greater Detroit, Livingston, USBC, Washtenaw. Bookmark the permalink.